There were brief moments early on when I thought this film might actually jump up and surprise me. There were early moments of tension, and even a decent premise laid out. Ultimately the film fell into similar traps that most films trying to tackle a story where the majority of the locations are confined to one space - it got a little repetitive and struggled to find new ways to engage the audience. But nonetheless, there were positives throughout, and it may have only performed slightly worse than I expected. 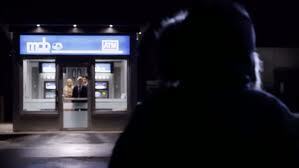 After leaving their company Christmas Party together, David (Geraghty) and Emily's (Eve) impromptu first date takes an unexpected turn when their coworker, Corey (Peck), asks them to make a late-night stop at an ATM. What should be a routine transaction turns into a desperate struggle for survival when an unknown man appears outside the vestibule. With the wintry temperatures dipping below freezing, and the morning sunrise still hours away, they have no choice but to play the man's deadly game of cat-and-mouse. You can already get an idea of exactly how this film would play out, even just from this brief discription. The film starts off with decent promise actually, and there were a few moments when I thought this film might actually surprise. Knowing so now, it's probably not a good sign when you're reviewing a horror film, and the first 20-minutes of the film - before any of the real "horror" takes place - is the best part. I did enjoy the introductions to these characters though, and thought that the minimalistic approach that the director was taking was a positive. While there aren't nearly enough real moments of acting in a film like this to truly gage performances, I did feel that Peck's cocky character provided a decent amount of entertainment early on and really did impress, especially being a former Disney Channel star. He steals the show in the first act of the film. Once we hit the second act however, and we're stuck with these three characters confined to one small room, it appeared the director stopped worrying about trying to develop the people in front of us, and instead reverted to generic plot devices and scare tactics, which I felt was a big miss. Maybe I'm in the minority, but I was really hoping we'd get to see a bit more character development than what was given. After inside the ATM, there was seemingly none (and what there was didn't seem to work for the earlier defined roles either). I understand that in moments of extreme panic and chaos people aren't usually going to act rational, but at the same time, I felt so disconnected to these characters, completely losing sight of who the director originally tried to introduce. Inside the booth, the film starts off with a good amount of tension, and I was at least intrigued initially. Being trapped in the middle of nowhere with a murderer outside isn't a pleasant thought. Shorty after all of the panic kicks in though, the film becomes more irritating than anything. Time and time again the situation is handled carelessly and foolishly and it makes for an annoying adventure. I'll always be the first to note that if things are handled perfectly and the characters are able to do what they need to, then there just isn't a movie; there has to be some irrationality for the premise to work. But I've seen horror irrationality work plenty of times in the past, and this wasn't it. I'm not saying that anyone would have interest in running outside with a verified killer standing 20-feet away (by the way, did I note that they could officially enter and exit the building anytime they wanted? ), but when there are three of them and only one of him, at some point you have to take a chance - especially when members of your party start dying or coming close to such. If I had to give any real props to the film it would probably be in music and cinematography departments. While neither was extraordinary, they both provided positive touches to an otherwise bland and disappointing film. The score did the best it could to keep a film affixed to one location moving, while the cold florescent lighting provided a very sterile and bleak ambiance. Given better writing material, most of the external technical components could have shined much brighter than they even appeared. The film tries to introduce a minor twist at the end to for added effect, but it really came off as much more tacked on than anything. I liked the concept for the "twist", but it felt very unfinished. Otherwise, just too many generic moments, with too much frustration to provide for anything more than an annoying and bland watch; the repetition became too overpowering. I don't usually have many expectations for fixed-location films like this to begin with, so when one fails to meet even those standards I know it's a big miss. There was potential within, but ultimately it appeared more like an unrealized premise than anything. Check this out if you appreciate the horror/thriller genre but have literally no other options in front of you; otherwise, you're not missing much at all with this film.